A Lagos-based lawyer, Ebun-Olu Adegboruwa, has urged the Nigerian Bar Association to boycott all the courts in the country following the State Security Services’ invasion of the homes and arrest of some judges.Mr. Adegboruwa, in a statement on Saturday, described the action as “full blown dictatorship now in action”. An overnight assault on senior judges across the country by the State Security Service had resulted in the arrest of a Federal High Court judge and alleged brutalisation of a sitting governor.Attempts were also made to arrest two Supreme Court judges. The official quarters of Walter Onoghen, who was recently recommended to President Buhari as the next Chief Justice of Nigeria, and Sylvester Ngwuta also of the Supreme Court were besieged by the SSS for several hours overnight. “It is now a case of anarchists in power,” said Mr. Adegboruwa.“The clampdown on judges has been on for a long time, through agents of government in the various institutions of oppression. “We are now back to the 1984 jackboot system of intolerance, where all dissenting views and opinions must be silenced. “It is condemnable for the DSS, which is an arm of the executive, to be breathing down on the judicial arm of government, under the guise of fighting corruption,” he said. Mr. Adegboruwa said the SSS raids had cleared any doubt that the President Muhammadu Buhari’s anti-corruption was a hidden agenda to perpetuate the administration in office beyond 2019. “It is meant to silence the opposition and to cover the inefficiency and cluelessness of this administration,” he said.“The 1999 Constitution in sections 4, 5 and 6 prescribes the system of separation of powers between the three arms of government.“But since 2015 when this government was sworn in, the executive arm under Gen Buhari has dominated and brutalized the other two arms of government. 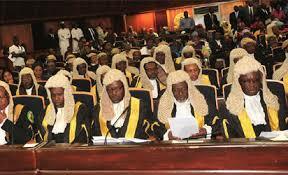 The leadership of the National Assembly is under trial and it is now the turn of the judiciary.”Mr. Adegboruwa said democracy prescribes independence of the judiciary, which allows judges an unfettered right of taking decision according to law and according to their consciences. “It is in this regard that the mindless invasion of the homes of judges by the DSS is totally condemnable,” he said.“It should never happen that the executive is indirectly threatening and intimidating members of the third estate of the realm. “As judges have no voices to speak officially, I call on the Nigerian Bar Association to declare an indefinite strike so that all courts of law in Nigeria will be boycotted until there is respect for the rule of law and the Constitution, commencing from Monday, October 10, 2016, until further notice,” he said.